1948 – Fumes containing fluorine from steel smelters in Donora, Penn., killed 20 local residents on Oct. 31, 1948, in the worst case of industrial air pollution in U.S. history. 1950 – For industrial producers, it took on average about 21 kilowatt-hours of electricity to produce one kilogram of aluminum in 1950. That figure improved to 15.7 kilowatt-hours per kilogram by 1999. 1950 – Newspapers across the U.S. reported on problems caused by fluoride emissions from aluminum smelters in the 1950s, labeling them “cattle suits.” National Geographic cited the cases in an August 1978 story on aluminum. 1950 – In December 1950, Kaiser announced that it would spend $3 million to install air pollution control systems at its Mead smelter near Spokane, Wash., following investigations of pine trees killed by fluoride. 1950 – Aluminum was in tight supply from 1950 through 1953 as a result of Defense Department requirements for the Korean War. The government offered financial incentives to the aluminum industry to increase production capacity, and 613,000 tons of new capacity was added from 1951-1954. 1950 – The use of aluminum during the 1950s and 1960s expanded through the construction, transportation, electrical, packaging, machinery industries and other sectors of the economy. Automobiles used aluminum in transmissions, engines, trim, electrical systems, air conditioning, brakes and paint. The largest commercial aircraft became nearly all aluminum. Growth in aluminum production outpaced growth in the American gross national product by a ratio of two to one. 1950 – The Hungry Horse Dam was only 124 feet tall and three years away from completion when the Hungry Horse News announced on June 6, 1950, that the Harvey Machine Company of California planned to build an aluminum smelter in the Flathead Valley of northwestern Montana using power from the new dam. 1951 – Rep. Mike Mansfield met with Anaconda Copper Mining Company Vice President Roy Glover on Oct. 16, 1951, in Washington, D.C., and learned that the company would take over Harvey’s plans for an aluminum smelter in the Flathead Valley. Facing numerous political difficulties, Harvey was unable to come up with the necessary financing to build the proposed smelter. 1952 – The Anaconda Copper Mining Company announced on Aug. 30, 1952, that their new aluminum plant would be built at the base of Teakettle Mountain near Columbia Falls. Construction was delayed as Anaconda finalized arrangements to purchase alumina from the Reynolds alumina refinery in Corpus Christi, Texas. 1952 – Various Anaconda Copper Mining Company executives and engineers traveled to Europe to look at aluminum smelters. The company chose to use technology used at the French smelter at St. Jean de Maurienne near the Swiss border for its new aluminum plant. An agreement with Pechiney was completed in November 1952. 1952 – Site clearing at the site below Teakettle Mountain began in September 1952. A 48-foot long sign promoting the new aluminum plant was erected near the Great Northern Railroad track so President Harry Truman could see it on Sept. 30, 1952, when he came for the dedication of the Hungry Horse Dam. 1953 – A brief ground-breaking ceremony with no fanfare on June 2, 1953, marked the beginning of construction of the Columbia Falls aluminum plant. Foley Brothers Inc. was awarded the general contract in July, and structural steel started going up in September. Production water wells and a railroad siding, raw material silos and tanks, offices, warehouses and a laboratory building were all erected in addition to a two-potline smelter, carbon paste plant and casting house. 1953 – Fluoride damages caused by the Alusuisse smelters in Switzerland led to violence in August 1953 when apricot farmers took over a train station and set freight cars on fire. Federal troops were called in. That same year, a group of farmers brought their sick cows to the Alusuisse headquarters and demanded compensation for damages caused by emissions from the company’s smelter in Rheinfelden, Germany. 1953 – A lawsuit was filed in Blount County, Tenn., on Jan. 1, 1953, alleging fluoride emissions from an Alcoa aluminum smelter had damaged farmlands and injured registered cattle. 1954 – Hungry Horse News publisher Mel Ruder warned about a possible strike by construction workers at the new aluminum plant in Columbia Falls, Mont., on March 26, 1954. Many of the workers had been employed at the Hungry Horse Dam project, where the prevailing wages were higher, but Ruder believed most workers migrated from project to project around the U.S. Construction workers at the aluminum plant went on strike from April through June. By August, nearly 1,500 workers were back at their jobs. 1955 – Paul and Verla Martin won their lawsuit against the Reynolds Metals Co. for damages to dairy cows by fluoride emissions from the Troutdale smelter in Oregon. For the first time in the U.S., it was proved in court that fluoride fumes could cause illness in humans. Reynolds was joined by seven other aluminum, metal and chemical companies as friends of the court. 1955 – The Anaconda Copper Mining Company changed its name to the Anaconda Company on June 18, 1955, to reflect the company’s diversification into other metals besides copper, including zinc, primary aluminum and uranium. 1955 – A representative of the International Union of Mine, Mill and Smelter Workers came to Columbia Falls on July 29, 1955, to organize workers at the new aluminum plant. Mine-Mill represented Anaconda Company workers at Butte, Great Falls, East Helena and Anaconda in Montana. Representatives from the United Steelworkers held a meeting in Columbia Falls on Aug. 29, 1955, to organize the new plant’s workers. 1955 – The $65 million Anaconda Company smelter was dedicated in an elaborate ceremony on Aug. 15, 1955, that included Con Kelley and other top Anaconda executives and Montana politicians. The Anaconda Aluminum Company became the fourth U.S. aluminum producer, joining the Big 3 of Alcoa, Reynolds and Kaiser. 1955 – The first railroad cars loaded with finished aluminum left the AAC smelter on Aug. 25, 1955. Only Potroom 1 was in operation at the time, and the new casting department was only producing 50-pound pigs. By October, the casting plant was producing 6-foot long 6-by-6 wire bars for the Anaconda Company’s wire mill in Great Falls. 1955 – Workers at the AAC plant voted on Nov. 23, 1955, to form the Aluminum Workers Trades Council, an umbrella organization for a dozen trades unions and one large industrial union. Mine-Mill had backed out of the election, and the workers rejected the United Steelworkers by a 281-147 vote. 1956 – The first labor contract at the AAC plant was signed in April 1956. Hourly wages ranged from $1.98 to $2.68. Comparable rates for lumber mills in Flathead County ranged from $1.85 to $2.70 per hour. 1956 – The AAC Employees Club building in Columbia Falls was completed in December 1956. With six bowling alleys, a large room for dances and parties, a reading room and lounge, and a kitchen for banquets, it was described as the Anaconda Company’s finest employees club. 1957 – Rapid expansion of the U.S. aluminum industry, including in the Pacific Northwest, outstripped demand and led to falling prices in the late 1950s. Alcoa built a smelter in Wenatchee, Wash., and Harvey built a smelter at The Dalles, Ore. Alumina refineries and aluminum smelters were built along the Gulf Coast and in the Ohio River Valley. 1957 – AAC reacted to the recession in the late 1950s by building a new fabricating plant in Terre Haute, Ind., to produce aluminum sheet, strip, rod, tube and extruded shapes and acquiring the Cochran Foil Co., which owned plants in Louisville, Ky., and around the U.S. which manufactured foil for the baking and frozen food industries. AAC also invested $2 million to expand the Louisville plants. 1959 – Fluoride emissions from the Reynolds aluminum smelter in Massena, N.Y., began to fall on Cornwall Island in the Gulf of St. Lawrence in 1959, threatening the health of livestock and humans. 1960 – Annual production of primary aluminum in the U.S. by the Big 3 and the Little 3 reached 2 million tons by 1960. Production grew 94% to 3.9 million tons by 1970. 1961 – AAC modernized its casting facility in 1961 to produce four different sizes of sheet ingot, including 8,900-pound ingots for the company’s Terre Haute rolling mill. The AAC casting plant’s capacity was increased to 1,500 tons of sheet ingot per month. 1963 – In a fluoride pollution case brought by fruit farmers, U.S. District Court Judge John Kilkenny ordered Harvey Aluminum in 1963 to improve air pollution control measures at its smelter at The Dalles, Ore. Kilkenny ordered the company to take steps to control secondary emissions in the potrooms by placing hoods over the reduction pots. 1963 – AAC and Harvey paid the BPA $1.66 per megawatt-hour for power at their aluminum smelters in Columbia Falls and The Dalles. Kaiser paid $2.02 for its Spokane smelter, Alcoa paid $2.07 for its Vancouver smelter and Reynolds paid $2.48 for its Troutdale smelter. AAC, however, paid higher shipping costs for raw materials. 1963 – Anaconda Company Chairman Clyde Weed announced plans to add a third potline at the AAC plant on Aug. 15, 1963. Construction began in early 1964, and Potrooms 5 and 6 went into production in August 1965. 1965 – AAC Vice President James F. Smith announced plans for construction of a fourth potline at the smelter in Columbia Falls in December 1965. Plans called for expanding the paste plant and other facilities in 1966. 1966 – The Anaconda Company entered into a joint venture in 1966 with Reynolds and Kaiser to mine bauxite and refine alumina in Jamaica under the name Aluminum Partners of Jamaica, or Alpart. The $175 million refinery was the largest in the world outside the U.S. when it started operating on May 18, 1969. 1966 – With excavation underway for a fourth potline, AAC announced on Aug. 11, 1966, plans to simultaneously build a fifth potline at the Columbia Falls smelter. Total plant capacity would increase to 175,000 tons per year. 1967 – Gov. Tim Babcock signed the Montana Clean Air Act into law on March 3, 1967. Air quality standards were adopted for sulfur dioxide, suspended sulfate, reactive sulfur, sulfuric acid mist, hydrogen sulfide, total suspended particulates, fluoride compounds in the air and fluoride in forage. 1967 – University of Montana Professor Clancy Gordon began to look at air pollution from the Anaconda Aluminum Co. smelter in Columbia Falls and to deliver public talks. Gordon had attracted attention for his fiery words and his efforts to stop fluoride pollution in Garrison. Mel Ruder interviewed Gordon on Dec. 9, 1967, for a story in the Hungry Horse News. 1967 – Six vertically-integrated aluminum companies dominated the aluminum industry of the free world by 1967: Alcan, Alcoa, Reynolds, Kaiser, Pechiney and Alusuisse. The companies held interests in bauxite mines, alumina refineries, aluminum smelters and aluminum fabricating plants around the world. 1967 – With assistance from Sens. Mike Mansfield and Lee Metcalf, AAC secured a new 20-year power contract from the BPA in September 1967. The contract included 80 megawatts of modified firm power for the smelter’s two new potlines. AAC agreed to take about 25% of its power in the form of interruptible power after 1973. 1967 – Excavation began for construction of a rod mill at the AAC plant on June 5, 1967. Hot metal was transferred from the smelter in crucibles hauled by forklifts straight to the building southwest of the main plant next to the Great Northern Railway tracks, and the 3/8-inch rod produced at the mill was sent to the Anaconda Company’s wire mill in Great Falls. The rod mill was shut down in 1980. 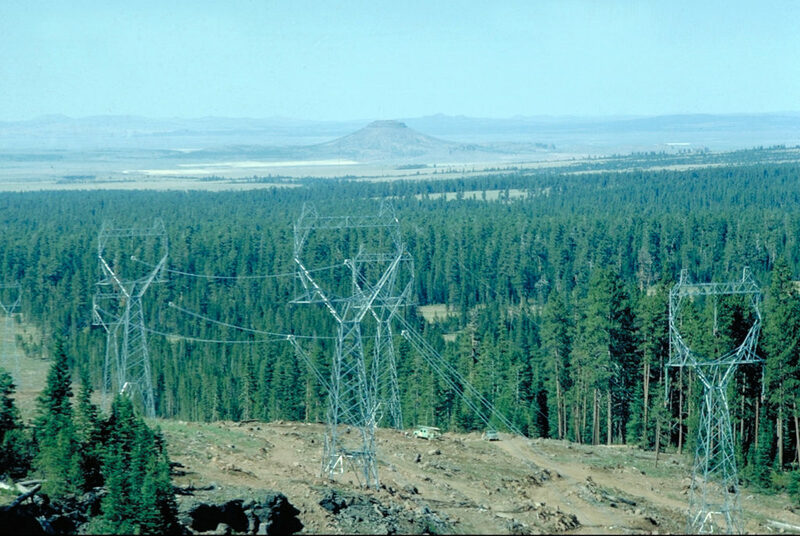 1968 – The BPA energized the first leg of three transmission lines for the new Pacific Northwest-Pacific Southwest Intertie on Sept. 20, 1968, linking the Columbia River hydroelectric dams to utilities in California. The size of the transmission system was increased later and became a critical component in the 2000-2001 West Coast Energy Crisis. 1968 – A grassroots environmental group called Gals Against Smog and Pollution (GASP) was formed in Missoula in 1968 in support of the federal 1967 Clean Air Act. The group was active through 1970, using petition drives, advertisements, rallies, marches, speeches and appearances before state regulatory agencies. Their first and foremost target was the Hoerner-Waldorf paper plant in Frenchtown, Mont. A chapter later formed in the Flathead Valley. 1968 – The Montana Board of Health adopted air pollution standards for timber mills and other industries on Nov. 23, 1968. Timber mills were required to stop burning waste wood in tepee burners. Standards had not yet been adopted for smelters. 1968 – The Anaconda Aluminum Co. entered into a 20-year lease agreement in 1968 with the Port of Everett in Washington for construction of an alumina unloading and storage facility. AAC’s plan was to unload 30,000 tons of Jamaican alumina each month from ocean-going cargo ships and then ship the alumina by rail to Columbia Falls. The company expected to save money by reducing the cost of buying alumina from a Kaiser plant near New Orleans and shipping it by rail. 1968 – The 103-mile long power line from the Noxon Dam in Montana to the Conkelley Substation at the Anaconda Aluminum Co.plant was energized for the first time on June 29, 1968. The bake-out procedure for the 120 reduction pots in Potline 4 began on July 1 with tapping scheduled for August. Potline 5 was in operation by October. 1968 – With the completion of two more potlines, fluoride emissions from the Anaconda Aluminum Co.smelter in Columbia Falls increased to 7,500 or even 10,000 pounds per day at full capacity. AAC relied on the same wet-scrubber technology installed in 1955 to reduce fluoride emissions in pot gases but had no air pollution control system in place for fugitive potroom emissions. The plant’s open-topped Soderberg anodes emitted numerous carbon-based carcinogenic compounds. 1969 – Glacier National Park Superintendent William J. Briggle requested in 1969 that the federal government conduct a study of the effects of fluoride emissions by the Anaconda Aluminum Co.smelter on Glacier Park’s flora and fauna. Clancy Gordon was contracted by the National Air Pollution Control Administration to conduct the study. 1969 – Flathead National Forest officials requested help from Forest Service scientists in Missoula to make a field evaluation of a problem on Teakettle Mountain they suspected was caused by fluoride emissions from the Anaconda Aluminum Co.plant. Plant pathologist Clinton Carlson began a series of studies of the matter. 1969 – Mel Ruder ran a front-page article in the Hungry Horse News on July 4, 1969, under the headline “Fluorides Killing Ponderosa Pine Trees in Flathead.” Ruder noted that thousands of dead trees covered the slopes of Teakettle Mountain, and the destruction had increased since the Anaconda Aluminum Co. put in two more potlines. 1969 – The Snowline Tree Co. reported damage to the company’s Christmas tree plantation by air pollution in July 1969. The plantation was located several miles west of the Anaconda Aluminum Co. plant and had 90,000 trees ranging from two to four feet high. By December, AAC had reportedly bought the tree plantation.